We are pleased to announce "8th Edition of international conference on Hepatology", scheduled from July 09 - 10, 2018, at Vienna, Austria. Event Date : 09 - 10 July 2018. 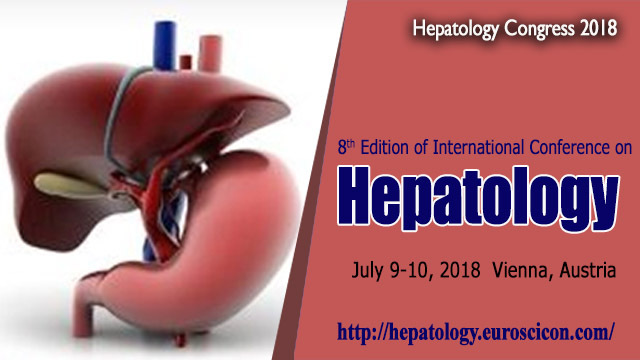 8th Edition of international conference on Hepatology is to be held on July 09-10, 2018 at Vienna, Austria.The conference highlights the theme “To discuss and share the latest updates and cutting-edge technologies in the field of Hepatology”, which will provide the best current evidence and insights into what the future holds for Hepatology. Hepatology 2018 conference consists of Keynote and Plenary lectures, Special sessions and Poster presentations. Best poster presenters will be judged and awarded during the conference. To encourage broad participation from all over the world EuroSciCon ltd is offering reduced registration fee for students. The HepatologyCongress 2018 anticipates participants, renowned speakers and eminent delegates across the globe to be attending the conference to share their valuable presentation and galvanize the scientific community. Scientific people from all over the globe focused on learning about emerging technologies in the field of Hepatology. This is a best globalized opportunity to reach the most immensely colossal assemblage of participants from the scientific community and research.